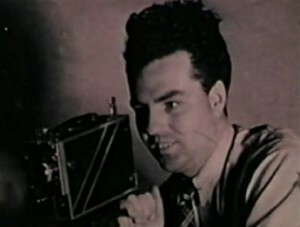 Smith pictured via Center for Home Movies. "Smith, who was born in Silver Spring, Nevada, in 1909 and lived until 2000, began working as a telephone repairman for the Pacific Telephone Company after high school. Due to interest in filmmaking – and his owning his own movie camera – the company asked him to make a “movie to show at a meeting.” Thanks to his skill at doing that, he won promotion to first level management to make movies for the company from its San Francisco regional offices. He produced instructional and safety films for the Bell System, including his most widely seen work, How to Prevent Backing Accidents, a film never out of date. Smith wrote extensively about his technical professional film work, as well as his creative amateur work, with numerous articles in American Cinematographer, Home Movies, and Popular Photography. Although an accomplished industrial filmmaker, his dedication was to his amateur films – 50 of them, between 1929 and 1991, including edited home movies such as Personal Pictures, [volumes 1-7], Vacation Snapshots, and Blanche’s Recital. Much of his amateur output, particularly in his early years, was dedicated to dramas influenced by Westerns and horrow, crime, and spy movies: among the titles are Forgotten Gold, Fantasy of Dreams, Streetcar to Heaven, and It Crawls by Night." NFPF 2012 grantee: Center for Home Movies. "NFPF 2012 grantee: Center for Home Movies," Moving Image Archive News, September 23, 2012. The Arthur H. Smith Collection is held by Center for Home Movies, and his films can be viewed at the Internet Archive. ​From Wealth of the Land (1937).